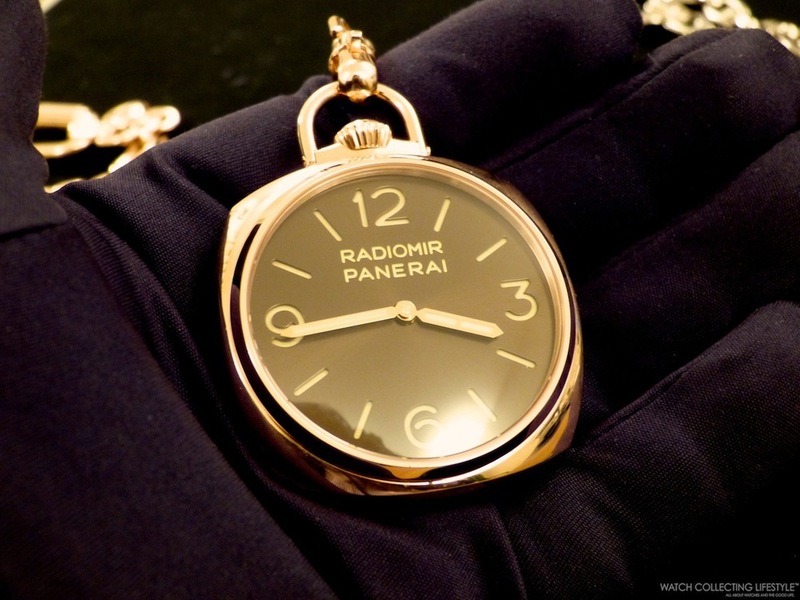 SIHH 2014: Panerai Presents the Pocket Watch 3 Days in Red Gold PAM 447 and White Gold PAM 529. Live Pictures and Pricing. The absolute purity of Panerai’s design achieves an unprecedented and exclusive expression in the new gold pocket watches, two extremely elegant Special Editions of only 50 units each: the Pocket Watch 3 Days Oro Rosso —red gold— PAM 447 and the Pocket Watch 3 Days Oro Bianco —white gold— PAM 529. The pocket watch is one of the most elegant and sophisticated masculine accessories, thanks to its association with the not-so-distant past when a gentleman would never have thought of wearing his timepiece on his wrist: until the early years of the century wristwatches were largely seen as a lady’s accessory. It was only during the First World War that the wearing of wristwatches began to spread among men, gradually transforming the pocket watch as an everyday item into an exclusive rarity, reserved for connoisseurs and collectors. In the first decades of the 20th century, Panerai’s Orologeria in Florence was a popular destination for anyone looking for a pocket watch, as is expressed by the inscription “Orologi da tasca delle principali marche svizzere” —Pocket watches of the main Swiss brands— on the window facing the Baptistery in Piazza San Giovanni. The new Pocket Watch 3 Days models are renewing this tradition, and enhancing it with the high quality watchmaking content of the Panerai manufacture in Neuchâtel. The case of the new Panerai pocket watches has the simple, perfect cushion shape of the Radiomir, the first prototypes of which date from 1936. Available in red gold and white gold, the polished case 50 mm in diameter has a single gold bow surrounding the winding crown at 12 o’clock, instead of the classic wire strap attachments. The bow is where you secure the beautifully done chain measuring close to 16 inches in length and a design inspired by nautical chains. Like the case, it is made entirely in red gold or white gold, terminated by two hooks of the same material which engage easily and securely. 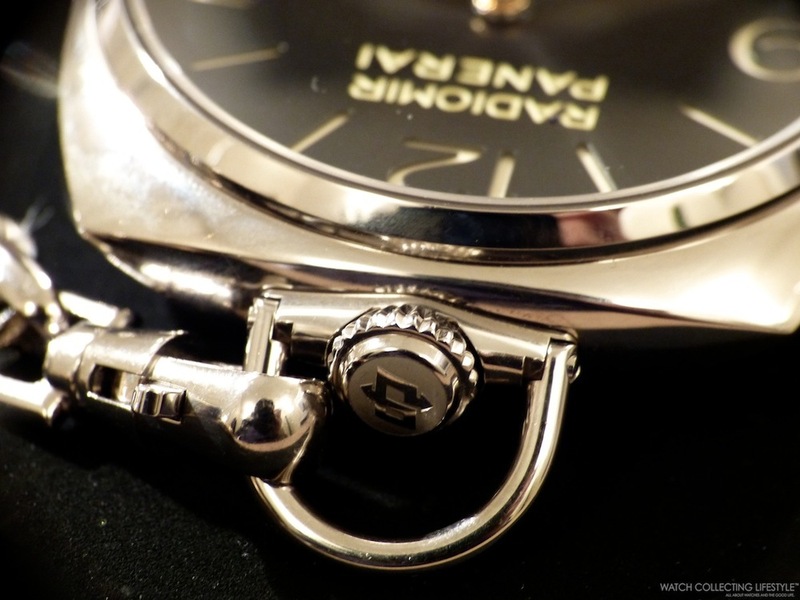 The dial of the watch is in the classic Panerai style, with large baton hour markers and numerals at the cardinal points, and it has the sun-brushed finish which endows both versions – anthracite for the white gold model and brown for the red gold – with a sophisticated appearance of great depth. The new pocket watches reproduce the construction which has been typical of Panerai dials since the 1930s: two superimposed discs enclose a layer of ecru Super-LumiNova, which shines with exceptional brightness through the apertures in the upper disc corresponding to the hour markers. This structure ensures remarkable legibility even under conditions of very poor light. As is often the case with precious objects of understated elegance, it is the back of the watch that hides the most fascinating surprise for enthusiasts of high quality watchmaking. The large round cover concealing the movement can easily be opened in order to admire the finish of the in-house calibre P.3001/10, completely developed and made in the Officine Panerai manufacture at Neuchâtel. Hand-wound with a power reserve of three days and power reserve indication —with luminova on the indicator hand— set in the back, the P.3001/10 calibre is presented for the first time in a new version, with the bridges and the two barrels skeletonised and with chamfered polished angles. The skeletonizing enables the finish and sophistication of the details of the movement to be observed, such as the wheel work and the gilded engraving. It also reveals the operation of the calibre, for example, the unwinding and winding of the springs in the barrels as the watch is running or while it is being wound. A fascinating spectacle which is protected and concealed from view by means of the polished cover, the outside of which can be personalized with engraving. The calibre P.3001/10 is composed of 210 components and provides a power reserve of 3 days. Consistent with the history of the brand, every Panerai watch has a high degree of water-resistance and the two new models, the Pocket Watch 3 Days Oro Bianco and the Pocket Watch 3 Days Oro Rosso, are no exception, being guaranteed to resist a pressure of five atmospheres —equivalent to a depth of about 50 meters. The exquisite mahogany box specially made to contain the watch also includes a special stand on which the watch can be placed when it is not being worn, turning it into a unique table clock. Sticker Price $71,800 USD Rosso —red gold— and $75,700 USD Bianco —white gold. Posted on January 27, 2014 by Editor & Publisher and filed under Panerai, SIHH and tagged Panerai Pocket Watch 3 Days Oro Rosso PAM 447 Panerai Pocket Watch 3 Days Oro Bianco PAM 529 Panerai Calibre P.3001/10.